Half inch scale- Non-electric Gold finish Candlestick comes as pair. Measures 1/8 inch dia. x 3/8 inches tall. 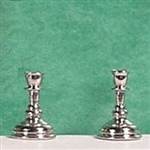 Half inch scale- Non-electric Silver finish Candlestick comes as pair. I inch Scale -Elegant non-electric Brass Candlestick with candles, comes as a pair. Measures 1/2 inch dia. x 1-3/4 inches tall. 1 inch scale- Non-electric Gold finish Candlestick with candles, comes as a pair. Measures 5/16 inch dia. x 1-1/16 inches tall. Measures 3/8 inch dia. x 1-9/16 inches tall.